The below framework illustrates how a collective global effort, across all sectors of society, can contribute to the movement of money to help combat climate change, extreme poverty and inequality. It will help some of the most vulnerable and desperate people in the world be elevated to positions that enable them to contribute effectively to society and that leads to them living happier, healthier, dignified and fulfilling lives. The Global Network Support Charity would like to introduce this bottom-up meets top-down solution - a solution that can help bring funds to where they are needed most. The Global Loyalty-Rewards Fundraiser is run by AIMS Supporter Services, the charity’s main sponsor. Global participation in the Global Loyalty-Rewards Fundraiser will result in billions of dollars being regularly donated by the Global Network Support Charity to help families living in extreme poverty, inequality and the health of the planet. For further details of the Global Loyalty-Rewards Fundraiser please view the ‘Participate Now’ page on this website. 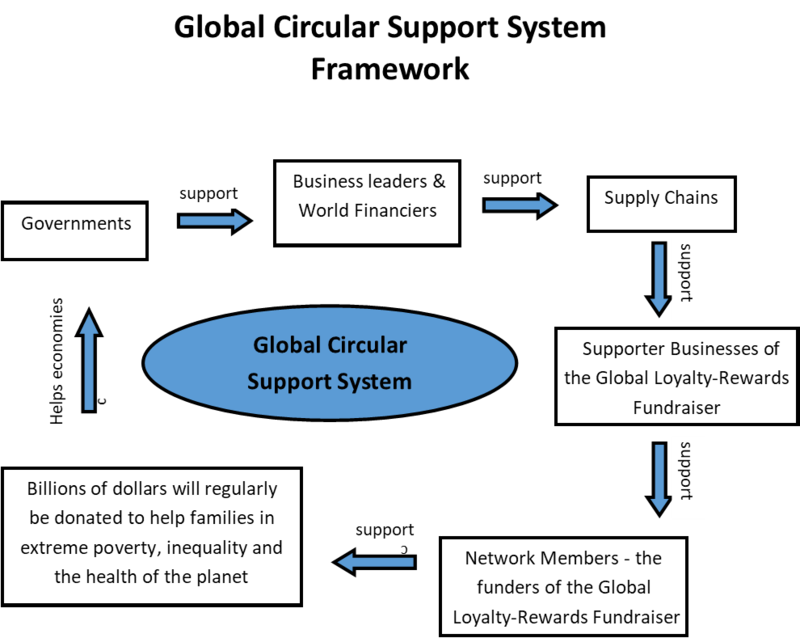 At the heart of the Global Circular Support System is a funding solution that will be instrumental in making a very big difference in the lives of these families in need.